Having been away for the last 10 days, I wasn’t sure if any chicks would be left by the time I got home. They could have fledged, or not made it that far. So it was a relief to hear loud cheaping coming from the box as I reached the front door yesterday. Not only were all the chicks still there, but it turns out we had 9 chicks rather than 8. They are much easier to count now they are bigger and less tangled. There’s been plenty of wing exercises in the last 24 hours, so I think they’ll be off soon. Last time I checked, I could only see 8, so one may have fledged (or just be hiding). I’m off on a work trip for a few days now, so won’t get to see the rest fledge. Dr C is under instructions to send me daily updates. When I am back from my trip I have some exciting adventures to tell you about, including another couple of ticks on my British Animal Challenge list. I had the pleasure of attending the Surrey Wildlife Garden Awards this afternoon, and winning the ‘Small private gardens’ category. 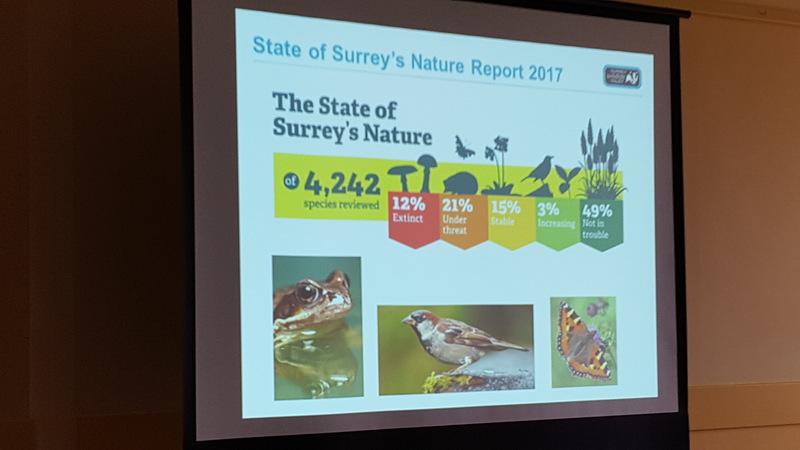 Dawn Fielding, the Surrey Wildlife Trust Community Engagement Officer, gave a short talk explaining the importance of gardens for wildlife, and the pressure wildlife in Surrey is under. 23% of Surrey’s species are extinct or under threat. 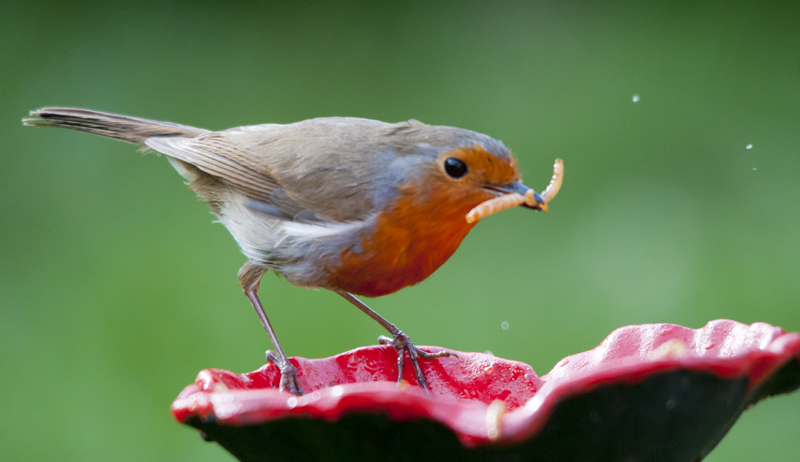 Gardens are a big opportunity to help our wildlife. They make up 12% of the land area of the county – more than nature reserves, so have the potential to make an impact. The awards recognised school gardens, community gardens, business grounds and private gardens that are havens for wildlife. This year there were 145 entries, with around half achieving gold award level, so I’m thrilled our garden has come top in its category (for the second time!). It was very interesting to hear and see pictures of what others are doing in their gardens, and fascinating to look around the Therapy Garden (which won the Community Garden Category). Neither Dr C nor I are particularly green-fingered, nor do we have massive amounts of time to spend gardening, but we do like the occasional Womble project (see the ‘How to‘ section for some examples). I like to think that if we can do it in our little garden, anyone can. 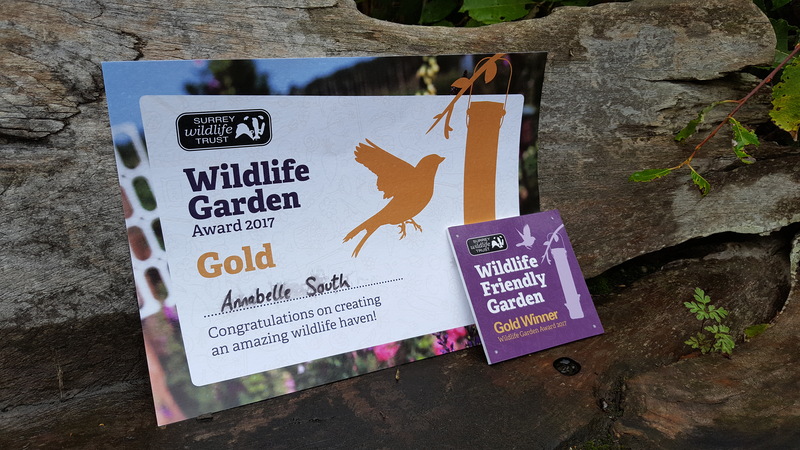 Nice as the award is, the real reward for wildlife gardening is watching the wildlife make use of the habitat, shelter and food we provide. It’s been a while since I last wrote about my British Animal Challenge, but I haven’t forgotten it. I managed to tick another species on my list this Easter: the bottlenose dolphin. Easter day was glorious down in Cornwall. Beautiful weather, and ideal for a walk. So that’s what we did. We followed the coast path from Godrevy Beach, up round Dean Quarry (more on that later). Of course, whenever I’m by the sea I keep my eyes peeled for exciting marine wildlife. A reasonably choppy day means I can spot vast numbers of imaginary basking sharks. But that day wasn’t so good for spotting imaginary wildlife; too flat. Which meant, when I did spot a fin breaking through the surface of the water, I knew it was something real. 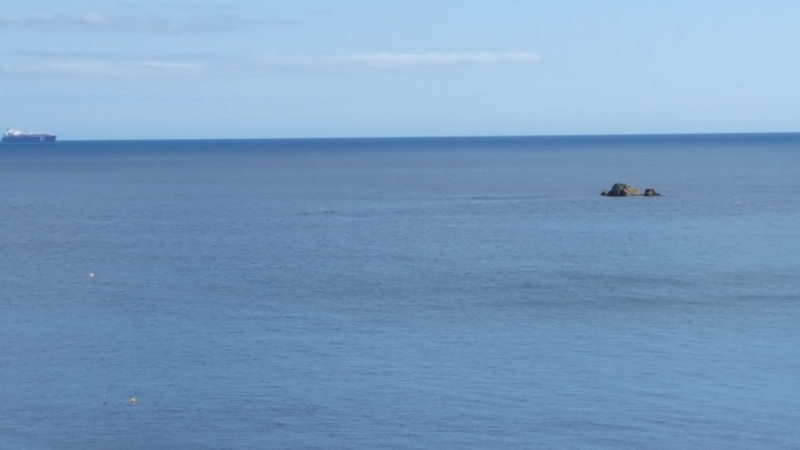 Distant dolphins (the tiny black specks) by the Manacle rocks. (Sorry for the dodgy picture – I only had my phone with me). The binoculars came out, and I was able to tell it was some kind of dolphin. Or rather, dolphins. There was a group of five. They travelled parallel to the cliffs, not far out, for quite a while, giving us an excellent, prolonged view. I couldn’t identify which species of dolphin they were there and then. I could tell they weren’t common dolphins or porpoises, both of which I’ve seen quite a few times before. But I didn’t know what they were. As soon as we got back to an internet connection, I looked up an ID guide, and concluded that they were bottlenose dolphins. This was confirmed a week later when we went out on a wildlife cruise, and, chatting to Captain Keith found that they’d seen the same group of dolphins in the same place on Easter Sunday afternoon, and they were, indeed, bottlenoses. I also learnt that one of the 5 was a youngster, which I hadn’t realised. Bottlenose dolphins are between 2-4m long, and impressively intelligent. They use sound for communication as well as hunting, and some have been trained by the military to locate sea mines. They can live for more than 40 years, and jump 6m in the air. They’re pretty impressive animals. The area we saw them in is the Manacles Marine Conservation Zone, off the east coast of the Lizard peninsula. This is a very special area for marine wildlife, but is under threat from plans to open a superquarry. Aside from the noise of the blasting and loading, pollution risk, increased traffic through the site of special scientific interest and area of outstanding natural beauty, and light pollution, plans involve building a new breakwater out into the Marine Conservation Zone. It was lovely seeing the dolphins there (we often spot cetaceans in that area), but there’s a real question over the future of wildlife in that area. If you want to find out more, visit the Community Against Dean Superquarry website. 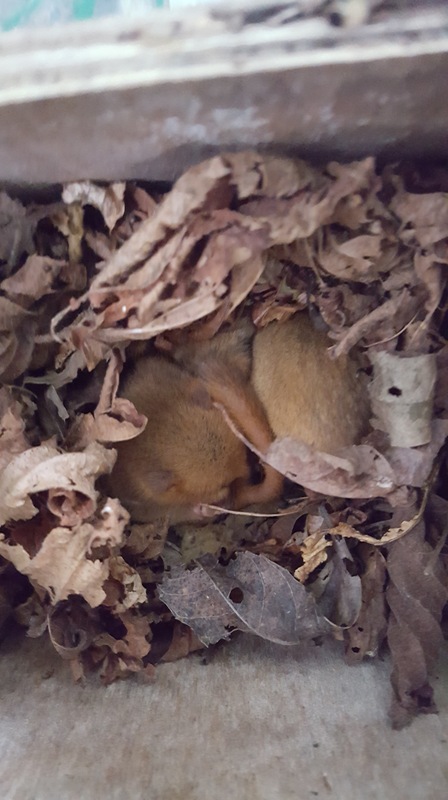 We had a fantastic dormouse box check at my site this month, finding six sleepy juveniles and an active adult. Juveniles are this year’s young, aged at least 28 days and weighing more than 10g. Their fur isn’t as golden as an adult, but they are still super cute. 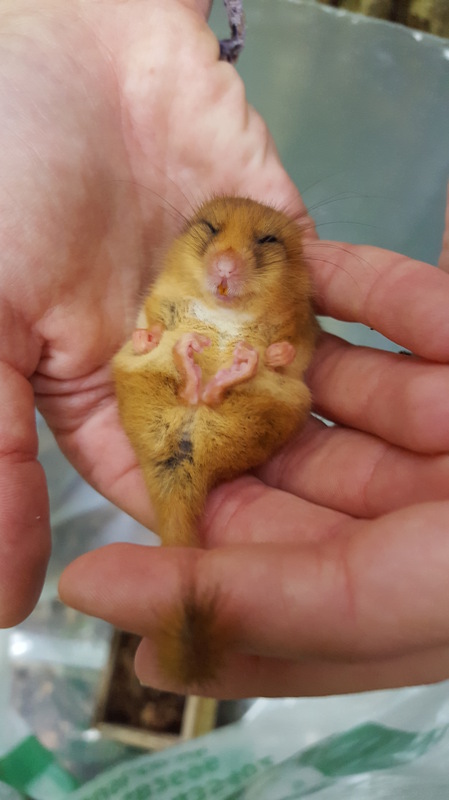 It’s really encouraging finding them this month, having not found any pregnant females or mothers with young last month – it shows they are breeding already, but using natural nest sites rather than dormice boxes. These youngsters have plenty of time to fatten up prior to hibernation. I particularly enjoyed this box check as Dan, who’s a Surrey Dormouse Group trainee, working towards his licence, was in charge of the clipboard, directing the volunteers and recording data. This freed me up to actually check boxes for a change. 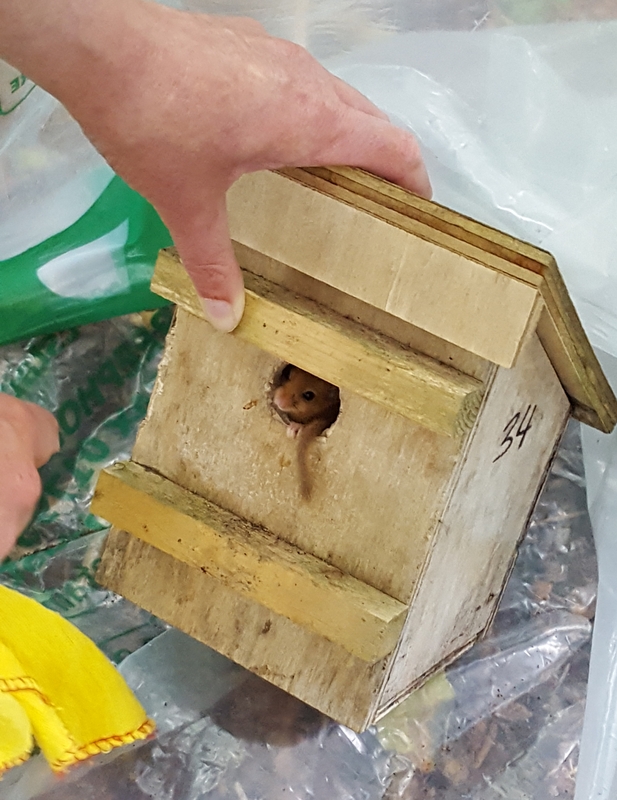 There’s a delightful moment of suspense when you slide the lid of a dormouse box across and peak in; what will be in the box? The dormice at my site continue to build rubbish nests. We never find textbook examples, with woven honeysuckle cores surrounded by green leaves. It’d be easy to dismiss many of the nests we find dormice in as apodemus nests or bird nests. This site has taught me to investigate any possible nest carefully. We found two juveniles in what was little more than a pile of leaves. And there was a shallow, mossy nest, which didn’t look very dormousy, but I checked it anyway. On first exploration of the cavity and down the sides I could feel nothing. I was almost ready to conclude it was empty, but I went back to double check the cavity and ended up finding three dormice. The check ended up taking quite a while, partly because we found quite a few dormice, and partly because those we did find weren’t in any hurry to get back into their nests. Several of the juveniles we found were awake but sleepy. One decided that halfway through climbing back into its nest was a good time to fall asleep. Another decided to leave its tail dangling out of the box for ages. I’ve been checking dormouse boxes for seven years, but they can still surprise, entertain and delight me. Tomorrow (Thursday) is the day we decide, individually and collectively, what we want from our government for the next five years. This is our opportunity to show politicians our values, our hopes, and our vision for the UK. I urge you to make the most of this opportunity – please vote, and encourage others (particularly young people) to vote too. When you vote, don’t do it based on what the media (or social media) say; vote based on policies. Much of our media has vested interests to protect, which may not be the same as what is in your, or our collective interest. Look beyond the headlines at what the parties intend to do. 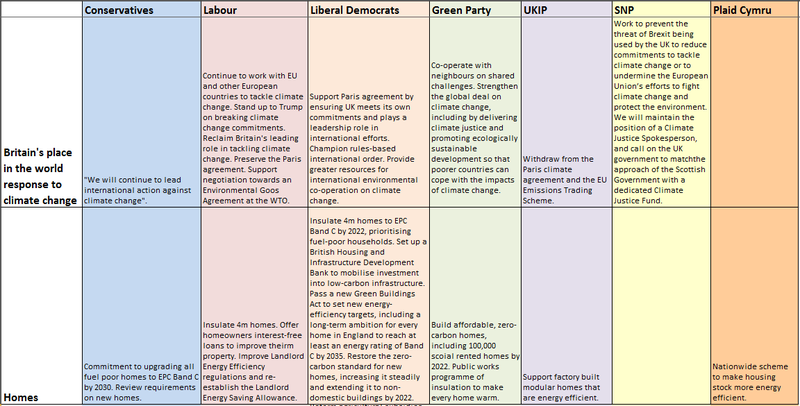 Obviously, environmental policy isn’t the only thing you’ll think about when you vote, but please do take it into account, as there are important differences between some of the parties. I hope my blog posts comparing what the party manifestos have to say on various environmental issues have been helpful to you. Having spent so much time immersed (reluctantly) in the manifestos, I’d got to the point where I wasn’t sure who I was going to vote for. 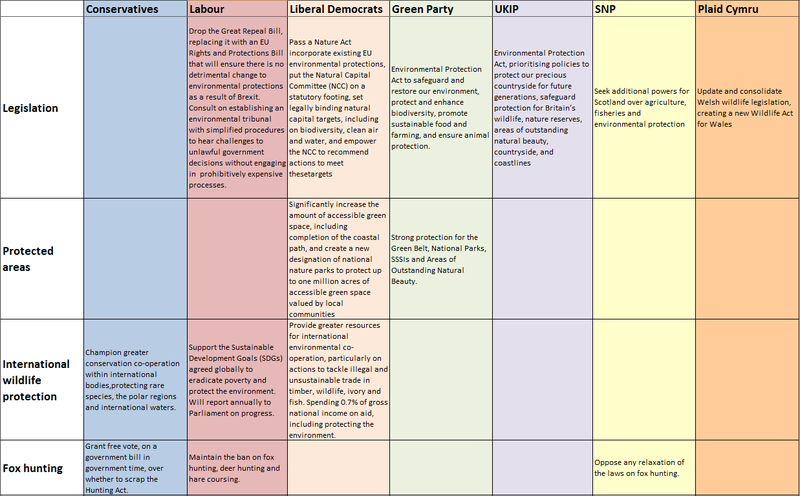 Three of the UK-wide parties (Labour, the Lib Dems and the Greens) had quite good policies on environmental issues. And my constituency is such a Tory safe seat, my vote will have no impact on the outcome. (More on this later, if you’re in the same position). 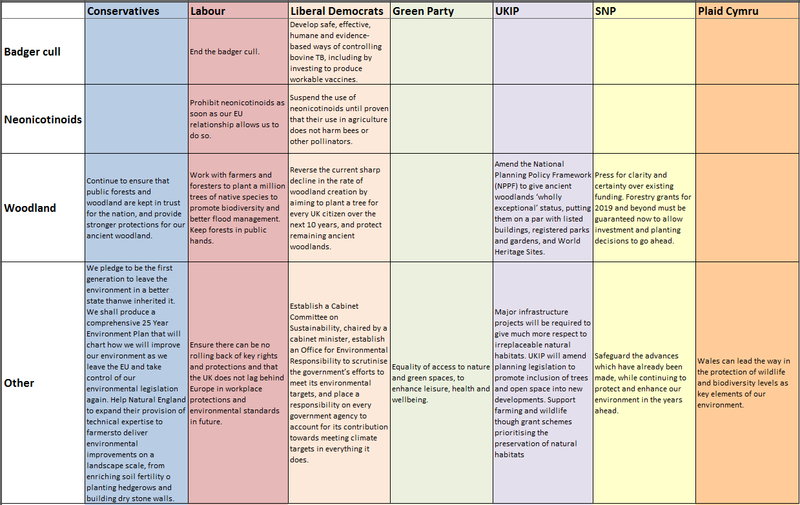 So I spent some time working through the ‘Vote for Policies‘ tool, covering all the issues I was remotely interested in. It’s more time-consuming than other similar tools I’ve tried, but I’ve found it the most helpful. If you’re not sure who you should vote for, give it go – it’s worth investing a bit of your time today to make sure you make the right decision. make fracking easier, including taking power to decide on whether fracking should be allowed away from local councils, and allowing exploratory and monitoring drilling to take place without the need to get planning permission. They make a few, vague but seemingly ambitious environmental claims (on climate change, air pollution and the environment in general), but consistently provide no details on how they will achieve them. This undermines their credibility, and is in keeping with the way they’ve run this whole campaign – refusing to answer questions on what they will do or how, and treating the voters as idiots who’ll happily write them a blank cheque. Soundbites are not going to reduce air pollution-related deaths or bring down our carbon emissions. If you think that there’s a chance that 97% of climate scientists might be right about climate change, please do not vote for UKIP. Climate change is too big an issue to pretend it isn’t happening, and we don’t need to do anything about it. Their policies on this issue would make the problem worse. We cannot afford that. Is it worth voting if you’re in a safe seat? Where I live is one of the safest Tory seats in the country. How I vote will make no difference to who ends up as my MP. So does it matter if I don’t vote? I believe it does. I can vote with my heart for the party I believe has the best policies – I don’t need to compromise to keep the worse option (the Tories or UKIP) out. But what does that achieve? When people look at the total number of votes each party received nationally, they will see my vote, and know that I support those policies and that vision for the UK. Opposition parties get “Short money” from the public purse, based on how many votes they receive. So by voting for my preferred party, I am also increasing the amount they receive (by a tiny amount) to support their work. 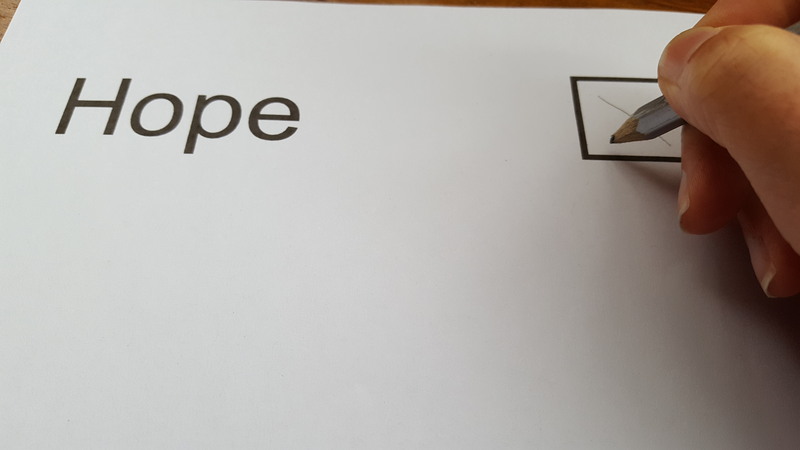 Tomorrow I’ll be voting for hope. Please join me. For today’s Election Focus, I am looking at what the parties say about how they will protect our seas. I have split this into several headings: protected areas around our shores; international marine protection; plans to tackle plastic pollution; and fishing. The Tories, Labour and the Lib Dems are all a bit vague on UK marine protected areas. How much (more) will they protect? What does that protection include? The Greens give a bit more detail. Only the Tories talk about marine protection around British Overseas Territories, and their plans sound ambitious. I am not sure if they are referring to the marine protection zone already announced, or if this is additional. Labour, the Greens, UKIP and Plaid Cymru all talk of introducing (or investigating) a plastic bottle deposit scheme to reduce waste. The Green Party seems to be the most ambitious in this area. With Brexit, future fishing policy is a big topic, and now is a good opportunity to improve management of our fish stocks. The Tories, Labour and the Lib Dems all mention sustainability in their plans. UKIP have a lot to say on fisheries, but it’s all about taking back control, with no mention of sustainability. Plaid Cymru and the SNP are both very quiet about protecting our seas. Air pollution is a very important issue, and we’ve been letting our politicians off the hook on it for too long. When I studied for my MSc in Public Health I learnt about the health effects of air pollution, and was amazed more people aren’t up in arms about it. It’s estimated to contribute to 40,000 deaths each year in the UK. It makes children ill, and life unpleasant for those of us who work in cities. And it affects the poorest in society the worst – those who can’t afford to live further from major roads. As a country, we’re really not doing well on this issue. The EU sets legally binding limits on air pollution, which we repeatedly exceed. The government were taken to court in 2015 for failing to do enough, and they lost. Last year a cross party committee of MPs criticised the government’s revised plan and called air pollution a public health emergency. Given this, you’d hope all the political parties would have robust plans to deal with this problem in their manifesto. Let’s see what they have to say. I have split this into several headings: legislation, diesel vehicles (a major source of pollution), other related transport policies, and other measures. I am not sure if the sentence from the Tory manifesto about planting trees is how they plan to tackle air pollution, or an unrelated point. It’s all in the same paragraph, along with promises to reduce litter and fill in potholes. It’s certainly not a robust response to a public health emergency. Many of the other manifestos spend quite a bit of time criticising the government’s record on air pollution. It’s an open goal and well deserved. But successive governments have failed to get a handle on it (including the Tory-Lib Dem Coalition, and Labour before them). There’s not a single mention of diesel in the Tory manifesto, despite it being a big contributor to the problem. I think the Lib Dem manifesto is the most convincing on this issue. UKIP and SNP give no indication of wanting to reduce air pollution, and UKIP’s policies may well make the problem worse. On a side issue, while searching for ‘air’ in the UKIP manifesto, I came across six mentions of Tony Blair. Given how long he’s been out of power, this seems a bit weird to me. Remember, this is just based on what they say in their manifestos (some of which had lots more detail than others) – I’ve kept my own thoughts out of the table. Click on the image to see it at full size. The Lib Dems had the most to say on these issues, and generally it looked pretty good to me. I particularly like their promise to set legally binding natural capital targets. I’m disappointed they didn’t come out and say they would keep the fox hunting ban. Their phrasing on the issue of bovine TB is obviously carefully selected not to upset anyone, but I find it’s lack of a direct statement on where they stand on the badger cull unsettling. The badger cull isn’t effective, humane and evidence-based, but the current government is fond of saying it is. I was surprised how many of the parties had things to say on woodland – they obviously think there are votes in protecting trees rather than bees or badgers. The Tory promise to “continue to ensure that public forests and woodland are kept in trust for the nation” made me laugh, given their previous (failed) attempt to sell off publically owned forests. They must think voters have very short memories. Once again the Tories make bold claims (“We pledge to be the first generation to leave the environment in a better state than we inherited it”) withour providing any information on how they will achieve it. But they say they will produce a 25 Year Environment Plan. We’ll just have to imagine what might be in that plan. The Greens have surprisingly little to say on this topic – maybe they feel it goes without saying. UKIP don’t have a huge amount to say on this topic, but what they do say doesn’t look too bad. SNP and Plaid Cymru don’t have a huge amount to say on this topic either. Thanks to Theresa May’s decision to call a snap election, three years ahead of schedule, I have to leave the lovely world of hedgehogs, dormice and baby birds to delve into the murky world of politics. 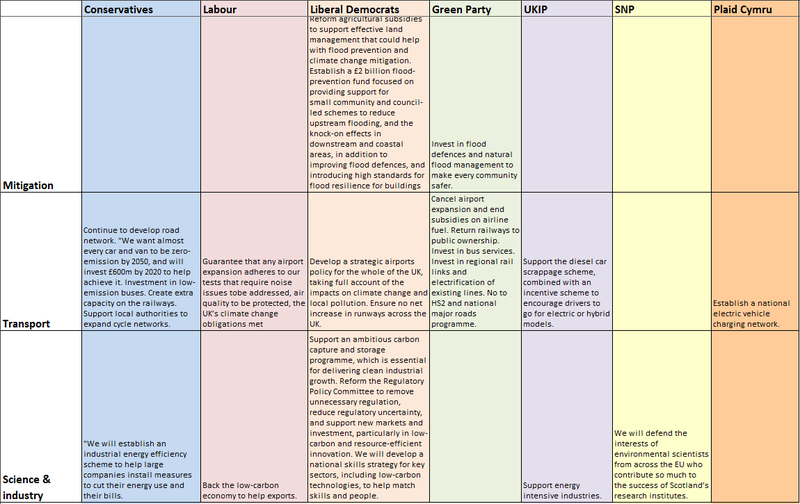 Over the next week, I’ll try to summarise where the major UK parties stand on various environmental issues, based on their published manifestos. I’m starting this series with the biggest challenge facing our generation: climate change. Where we mark our X on the ballot paper next week will have big implications not just for the next five years, but for much longer. And there’s a real difference between the parties on this issue as well. NB. I’m not going to report on all of their policies related to homes / transport etc – just those they link to carbon emissions or climate change. 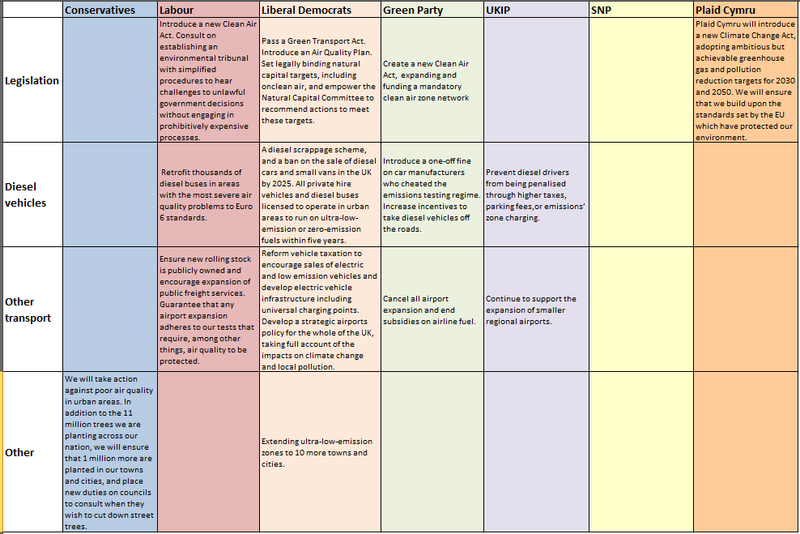 The manifestos of the parties varied greatly in length, meaning some give much more detail than others. I didn’t ask them for further information, or search their websites. Having said that, the longer manifestos didn’t always mean more information about how they were going to achieve their stated goals. 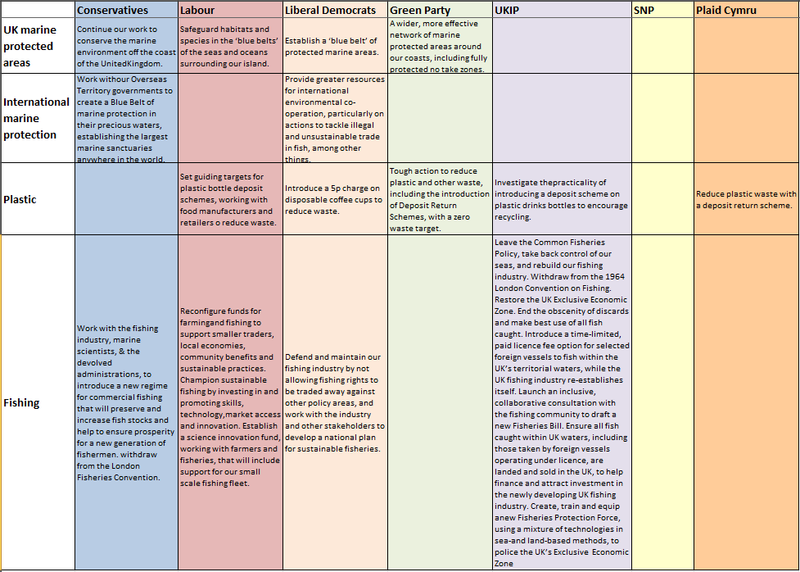 The following tables are, I hope, an accurate reflection of what the parties say in their manifesto. Of course, we all know that manifesto promises don’t always materialise, but, without a crystal ball, the best we can judge parties on is their prior actions and what they say they will do in the future. Click on the tables to see them full size. I’ve tried to be fairly neutral in my reporting of what the parties say, and you can draw your own conclusions. But since it’s my blog, I thought I’d add a few of my reflections, which you can ignore if you want to. The Tories provide very little detail about what they will actually do to combat climate change. They don’t spell out what their power generation mix will be, but their support for shale gas shows that they just haven’t got the idea that fossil fuels are not the way forward. They pay lip service to our carbon reduction obligations, but provide no info on how they will meet them. They even try to claim credit for the Climate Change Act that was introduced by the Labour government in 2008. 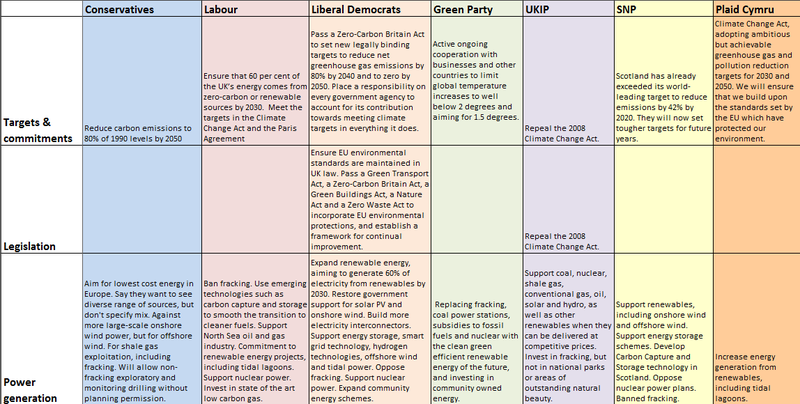 Some of the parties refer to climate in change in many different sections of their manifesto, showing that they get that this issue is not just about power supplies, but will reflect many aspects of our life. Some of the parties (Labour, Lib Dems, Greens, SNP) present a clear vision of how they see Britain playing a role internationally, – I found this quite inspiring. Some of the parties (Labour, Lib Dems, SNP) presented the climate change challenge as an opportunity to develop new technology, industries, exports and jobs in the UK. A vote for UKIP is a vote for climate catastrophe. The Green Party manifesto was about a quarter of the length of some of the others, so inevitably has less detail. I’m not sure how the Tories managed to write 88 pages while saying so little about what they will actually do. Labour and the Lib Dems both have quite long, detailed manifestos. How do hedgehogs mate? Carefully, as the old joke goes. 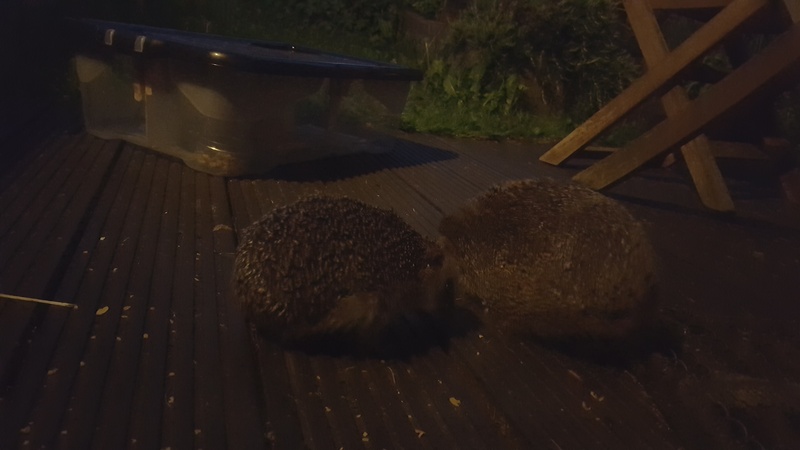 Last night I didn’t quite get to witness mating, but did get to watch hedgehog courtship at close quarters. 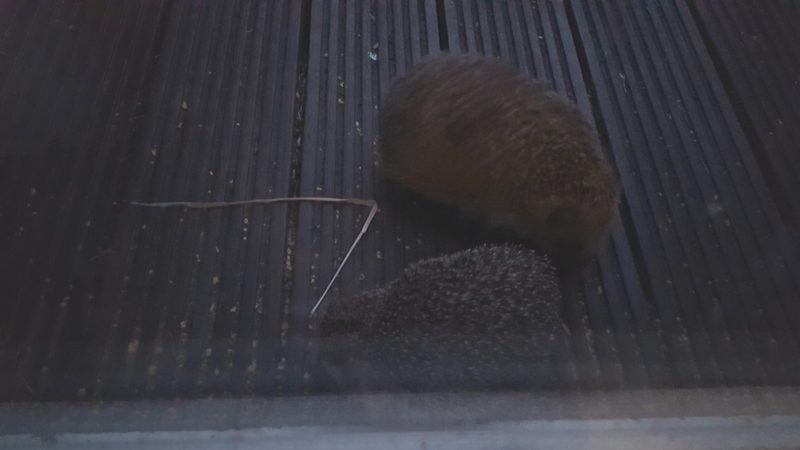 Just before I went to bed last night, I went down to the patio door to see if there were any hedgehogs about. It was still quite light, so I wasn’t expecting one, but there, snuffling round just the other side of the door, was a small hedgehog (trying to hoover up any mealworms Reproachful Robin had dropped from the feeder attached to the door). Please to see one so close (separated only by the doubleglazing), I glanced round the garden and saw another, larger hedgehog approaching. He clearly was not after the mealworms. What ensued was a protracted courtship. He circled her, trying to get her, occasionally rubbing the side of his snout against the ground (do they have scent glands there?). She, equally determined, snorted regularly and turned round on the spot to make sure he never got behind her. Occasionally he would change direction, and try another angle of approach. When she moved away from the door, so her back was no longer protected by it, I thought she might be softening towards him. But the circuits continued. From time to time she would seem to get annoyed with him, and charge him. But then the dance continued. It was fantastic seeing such an intimate moment at such close quarters. But after 45 minutes of this, tiredness won and I headed up to bed. So I’ve no idea how it ended. Let’s hope we have little hoglets visiting the garden soon!